SkyWest, Inc. reported financial and operating results for Q1 2018, including net income of $54 million, or $1.03 per diluted share, compared to net income of $35 million, or $0.65 per diluted share for Q1 2017. The improvement in Q1 2018 pre-tax income from Q1 2017 was primarily due to SkyWest’s ongoing fleet transition. Since Q1 2017 19 new E175 aircraft have been added and 46 CRJ and ERJ 50-seat aircraft and 25 CRJ700/CRJ900 aircraft have been removed. Revenue was $783 million in Q1 2018, up from $747 million in Q1 2017. The increase in revenue included the net impact of adding new E175 aircraft and improvement in the economics of SkyWest’s fleet mix since Q1 2017, partially offset by the removal of unprofitable or less profitable aircraft over the same period. Operating expenses were $695 million in Q1 2018, up from $671 million in Q1 2017. The increase in operating expenses included additional labor, engine maintenance and fuel costs. The effective tax rate for Q1 2018 was 19% compared to 34% in Q1 2017. The lower tax rate in Q1 2018 was primarily due to the reduced federal rate under the new tax law enacted in Q4 2017 and additional discrete tax benefits from stock compensation in Q1 2018. ExpressJet Airlines, Inc. continued the previously-announced 2018 wind down of its flying agreement with Delta during the quarter. At the end of Q1 2018, ExpressJet had six CRJ900s and 31 CRJ700s remaining in service under the Delta agreement. ExpressJet anticipates returning seven leased aircraft to Delta in Q2 2018 (six CRJ900s and one CRJ700). ExpressJet continues to engage in discussions around the CRJ700s scheduled to come out of service with Delta later this year and remains pleased with the level of demand for the CRJ700 product. * Adjusted Completion excludes weather cancellations. Raw Completion includes weather cancellations. Total debt for the quarter was $2.8 billion, up $89 million from December 31, 2017, including debt issued for acquired aircraft, partially offset by scheduled principal payments. Copyright Photo: The last Bombardier CRJ900 will be taken out of the Delta contract in the second quarter of 2018. The remaining CRJ700s will be retired with Delta by the end of the year. Delta Connection-ExpressJet Airlines Bombardier CRJ900 (CL-600-2D24) N307PQ (msn 15307) ATL (Jay Selman). Image: 403371. 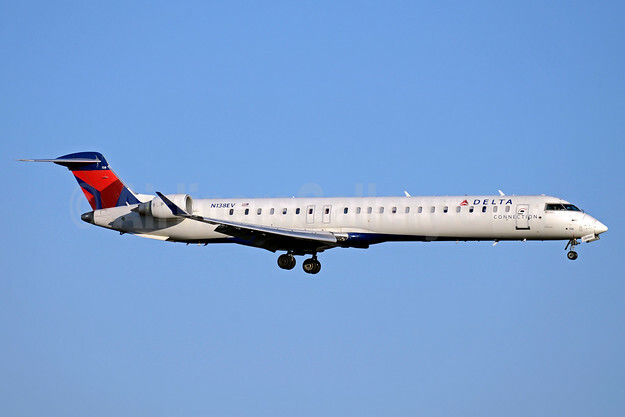 This entry was posted in Delta Connection, SkyWest Airlines and tagged Bombardier CRJ900 (CL-600-2D24), Delta Connection-ExpressJet Airlines, msn 15307, N307PQ on April 27, 2018 by Bruce Drum. Delta Air Lines is planning to drop Delta Connection service to Killeen/Fort Hood, TX on January 16, 2018. Delta connects the airport with the Atlanta hub, operated by ExpressJet Airlines. Copyright Photo: Delta Connection-ExpressJet Airlines Bombardier CRJ900 (CL-600-2D24) N138EV (msn 15235) ATL (Jay Selman). Image: 403370. This entry was posted in Delta Air Lines, Delta Connection and tagged ATL, Bombardier CRJ900 (CL-600-2D24), Delta Air Lines, Delta Connection, Delta Connection-ExpressJet Airlines, ExpressJet Airlines, msn 15235, N138EV on December 3, 2017 by Bruce Drum. ExpressJet Airlines, a wholly-owned subsidiary of SkyWest, Inc., this month is operating its last Canadair (Bombardier) CRJ200 revenue flights. As previously reported on December 23, 2016, ExpressJet expected to transition to flying primarily dual-class aircraft in its CRJ operation by removing its Bombardier CRJ200 aircraft from service over the next year. The company has been gradually retiring the CRJ200 fleet. Some aircraft have been transferred to partner SkyWest Airlines and all others are now in storage. Some aircraft were relocated to Oklahoma City, OK. The retirement of the ExpressJet CRJ200 fleet was stepped up this month. N854AS is operating today but it is expected to join the others soon in retirement, probably after the Thanksgiving holiday weekend. Copyright Photo: Delta Connection-ExpressJet Airlines Bombardier CRJ200 (CL-600-2B19) N923EV (msn 7826) ATL (Jay Selman). Image: 403333. This entry was posted in Delta Connection, ExpressJet Airlines and tagged ATL, Bombardier CRJ200 (CL-600-2B19), Delta Connection-ExpressJet Airlines, ExpressJet Airlines, msn 7826, N923EV on November 26, 2017 by Bruce Drum.  Long-term agreement secured with United Airlines. As part of this plan, ExpressJet has secured a new, five-year extension of its United Airlines ERJ 145 contract, effective January 1, 2018 through Dec. 31, 2022. The new agreement enhances ExpressJet’s United partnership and provides long-term stability to its model. It also provides ExpressJet pilots with continued access to United’s Career Pathway Program. Financial terms of the agreement were not disclosed.  Early termination of Delta CPA. Additionally, ExpressJet and Delta Air Lines mutually agreed to initiate the wind-down of its remaining dual-class flying agreement under the Delta Connection brand, allowing ExpressJet opportunities to place aircraft with other partners. The agreement, which includes 28 CRJ900s and 33 CRJ700s, was previously scheduled to expire beginning in 2019. The aircraft financed by Delta, including all CRJ900s, will be returned to Delta beginning in fourth quarter 2017; ExpressJet expects to transition other aircraft previously operated under its Delta agreement to other major partners throughout 2018.  Agreement with American for eight additional CRJ700s. As part of this realignment, ExpressJet has secured an agreement with American Airlines to transition eight additional CRJ700s to its American Eagle operation. That transition is expected to take place during second quarter 2018. Copyright Photo: Delta Connection-ExpressJet Airlines Bombardier CRJ900 (CL-600-2D24) N307PQ (msn 15307) ATL (Jay Selman). Image: 403371. 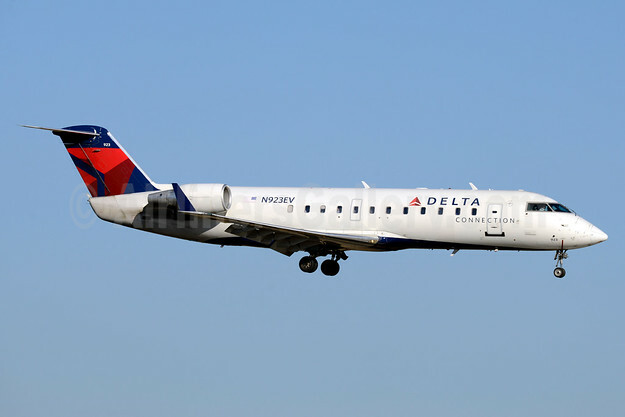 This entry was posted in Delta Air Lines, Delta Connection, ExpressJet Airlines and tagged ATL, Bombardier CRJ900 (CL-600-2D24), Delta Connection-ExpressJet Airlines, ExpressJet Airlines, msn 15307, N307PQ on August 11, 2017 by Bruce Drum. SkyWest, Inc. has announced additional fleet transitions and contract updates designed to reduce SkyWest’s long-term fleet risk and enhance its ability to respond to changing partner needs. Specifically, SkyWest’s ExpressJet operation expects to transition to flying primarily dual-class aircraft in its CRJ operation by removing its Bombardier CRJ200 aircraft from service over the next year. The removal of the CRJ200 aircraft reduces ExpressJet’s future required investment in its 50-seat fleet and is expected to improve the airline’s operating efficiency by eliminating an aircraft type from its platform. SkyWest also announced ExpressJet and American Airlines have agreed to place 12 dual-class CRJ700s into service under a multi-year term. These CRJ700s had been scheduled to be removed from service under a previously-disclosed early lease return arrangement. Additionally, SkyWest and Bombardier entered into a termination agreement covering Bombardier’s residual value guarantee (“RVG”) agreements on 76 CRJ200 aircraft owned by SkyWest Airlines and ExpressJet. Bombardier agreed to pay SkyWest $90 million by January 2017 along with certain other consideration in exchange for the release. Both the required sale of each aircraft and the cost to SkyWest of returning the aircraft to mid-time condition were points of risk and uncertainty for SkyWest that this termination agreement eliminates. As a result of the expectation to remove ExpressJet CRJ200s from service and the Bombardier RVG termination agreement, SkyWest is evaluating its total 50-seat CRJ200 fleet and related long-lived assets for impairment in Q4 2016. SkyWest currently anticipates it will record a non-cash impairment charge in Q4 2016 estimated to be in the range of $440 million to $490 million (pre-tax) on its CRJ200 aircraft and other 50-seat aircraft assets, net of the $90 million in cash proceeds from the Bombardier termination agreement. This entry was posted in Delta Connection, ExpressJet Airlines and tagged ATL, Bombardier CRJ200 (CL-600-2B19), Delta Connection-ExpressJet Airlines, ExpressJet Airlines, msn 7826, N923EV on December 23, 2016 by Bruce Drum.